Premier of Nevis and Minister of Finance Hon. 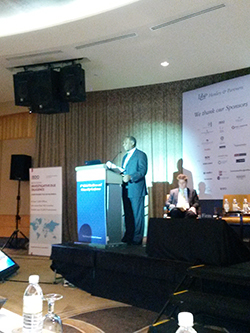 Vance Amory at the 8th annual Henley & Partners Global Residence and Citizenship Conference at the iconic Fullerton Hotel. CHARLESTOWN NEVIS (November 11, 2014) – Nevis is the island of choice for investment opportunities. That was the message told to industry leaders, investors and international service providers by the Premier of Nevis and Minister of Finance Hon. Vance Amory while in Singapore at the 8th annual Henley & Partners Global Residence and Citizenship Conference, held recently at the iconic Fullerton Hotel. 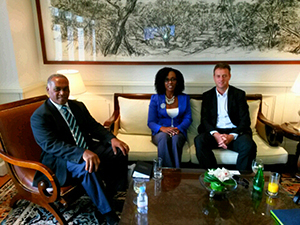 The Premier who was accompanied by Director of the Nevis Investment Promotion Agency (NIPA) Ms. Kimone Moving, attended the Conference in a bid to promote financial services, luxury real estate and Citizenship By Investment (CBI). Addressing the delegates, the Premier stated that he was extremely encouraged by the concept of a global citizen, since countries of the world were becoming more inter-dependent as the vision of a global village became a reality. The concept, he explained, also presented the prospect for small island states to become truly integrated into the world economy and compete effectively with lower tax rates and more ecologically friendly home environments. The Premier highlighted that St. Kitts and Nevis ranked in the top five citizenship programmes, which provides the opportunity for persons to invest in St. Kitts and Nevis and become citizens. He explained that this could be achieved by investing a minimum of US$400,000 for the purchase of a condominium or villa in an approved real estate project or by making a contribution of at least US$250,000 to the Sugar Industry Diversification Foundation (SIDF). Mr. Amory emphasized that the real estate option provided an alternative, which paved the way for the luxury residences on the island. This was attributed to the growing economy of Nevis for over two decades. He also emphasized that Nevis provided upscale residence options for the discerning investor. The Premier told delegates that with the interest generated by the Citizenship by Investment programme in St. Kitts and Nevis, the island of Nevis continued to attract high net-worth individuals to its shores. He spoke to some of the factors which accounted for the high level of interest. “We are also ranked among the top performers in respect of the United Nations Human Development Index, which is a major achievement for a small island,” Mr. Amory said. The citizenship by investment programme is complemented by an active and progressive financial services sector. “The island of Nevis offers financial services products such as International Business Companies, Foundations, Limited Liability Companies, Captive and Reinsurance and Banking which can be used for wealth management, asset protection and investment purposes. “We have been in this business for over 30 years and have developed a reputation for speed, efficiency and exceptional service. We have over 50 service providers and professionals who can create various legal structures to cater to the needs of investors,” Premier Amory stated. He spoke to Nevis as an upscale tourist destination, which attracted many visitors to its shores to enjoy the beaches, sunshine, tranquillity and warm, friendly people. Mr. Amory also noted that Nevis was the birth place of Alexander Hamilton, the First Secretary to the United States Treasury and the marriage of Lord Nelson, an English Admiral, to Nevisian Fanny Nisbett. Delegates were intrigued by the historical overview and the photo collage of the island on display. The Premier also spoke of his Administration’s vision for the development of the island, through Foreign Direct Investment (FDI), to provide more employment and a long-term economic plan for the island. He emphasized that Nevis is still open for business. During the visit to Singapore, Premier Amory and Director of NIPA also held private meetings with representatives from Premier Fiduciary Pte Ltd, AMS Trustees (Asia), TPS Corporate Services, VISTRA (Singapore), Pricewaterhouse Coopers (PwC), Surbana Urban Planning Group, Axora Wealth, FIDES Corp, RAJAH & TANN ASIA, PROSEL Ltd, FALCONCREST LIMITED and Sports & Travel Magazine (Lennox & Ooi Media Pte Singapore). The conference saw some 200 delegates and featured top investor residence and citizenship programs globally. The next Henley & Partners Global Residence and Citizenship Conference is slated for Dubai in 2015.